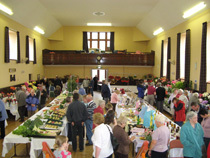 The Victoria Hall is situated near the centre of Ellon about half way along Station Road. 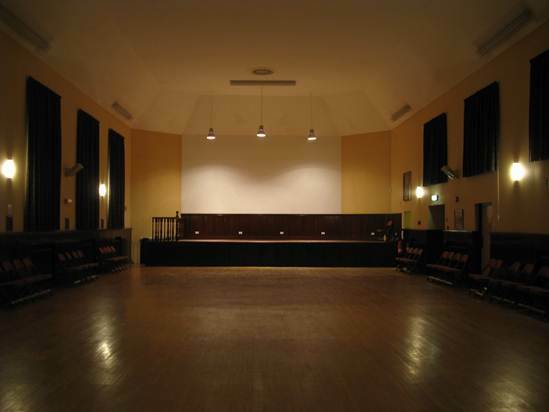 Dating from 1901, the building is a historic feature for the town comprising two floors; the ground floor, together with its associated extension buildings, is occupied by the Ellon branch of the Royal British Legion whereas the first floor, comprising a large function hall and associated facilities (referred to as the ‘Victoria Hall’) is run by the Victoria Hall Trust. The main floor area is 204 square meters; large enough to accommodate seating for up to 240 when laid out in theatre style or 170 where a table meal and dancing are required. 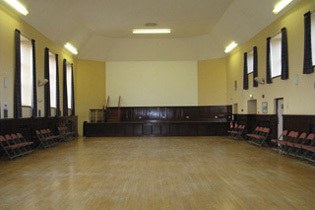 The capacity for a ceilidh is around 120 - 140. 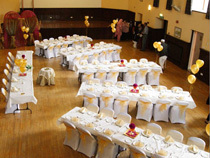 Flexibility is provided through the provision of a well fitted kitchen, tables and chairs to permit its use for a variety of functions and special events and as such, it is home to a variety of regular classes and activities and numerous private events such as wedding receptions, parties and group meetings. It hosts Ellons cinema venues on a regular basis. 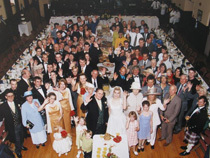 Complete with a generous stage area, the Hall provides an excellent venue for both regular and one-off events for anyone and any group within Ellon and the surrounding community. For further details, advice, or to discuss arrangements and to make a booking contact us. The kitchen is provided with good quality commercial facilties including a 6-gas ring/oven cooker, portable warming/serving cupboard, chill cabinet and dishwasher. There is a crockery and cutlery inventry provided for up to 200 places which is also available for separate hire for other private events.